After many years of travel, I have learned, for the most part, that the usual things you carry with you on your journey — that laundry list of gadgets, toiletries and clothes — is not nearly as valuable abroad as having a good sense of tact. Our first steps in a new place are often clumsy ones. We are learning, everything, for the first time, in real time. And, because of this, we are likely to make mistakes, having not been acquainted with the unspoken cultural norms and unique societal rules that so govern this new patch of land. Sometimes, the situation is poised for great comedy. We assume a quirky by lovable Bill Murray-type persona, nudge to Lost in Translation, making wry, but altogether innocent, assumptions about the overly alien foreign country we’ve come to, only to stand out as very wrong. Using condiments incorrectly — perhaps the wrong soya sauce with your sushi, in Japan — will star you in such a comedic role. People will most certainly laugh at you. If you find yourself in Seoul and decide to rush into your next beer, whipped up into a thirsty rage by globs of kimchi,pouring it for yourself, you’ll be considered to be a bit rude — ruder than normal — but your foreignness will, out of courtesy, be implicitly ignored or outright forgiven. Cross-cultural transgressions are, however, not always so readily expunged by calling of the next round of beer or soju. Some of these laws of the land are just that — laws that anyone and everyone is expected to handle with a respectful air of gravitas, no leeway allowed for clumsy Murry-isms. I am, of course, talking about the drastically different spectrums various countries sit on in their interpretation of freedom of speech. What you say or do can, and will, be used against you in a foreign court of law, if you break those rules. Rules, mind you, that you are expected to become telepathically aware of by the time you hit the ground. Full stop. Across Asia, there is predictable structure to everything. Where people belong in society. How they should respond to others outside of their class. And what fine lines that, when crossed, can lead to certain exile or excommunication. Recently, I got to revisit one of my favorite countries in Asia: Thailand. Here the central, most forbidding, alienating, all-around disrespectful taboo has to do with the monarchy. Thailand’s monarchy is protected from “offensive speech” by a lese majeste law — French for “leave the king.” Those who break this law can look forward to not only being rendered persona non grata in Thailand, but also, if you commit the offense while in-country, jailed. Thais, themselves, are calculatingly careful when addressing the monarchy. But that doesn’t mean negative sentiment doesn’t exist; instead, it is communicated in quiet, if at all, over private dinner tables, or subtle symbols. This particular trip happened to coincide with a recent national holiday, that of Princess Sirindhorn’s birthday. 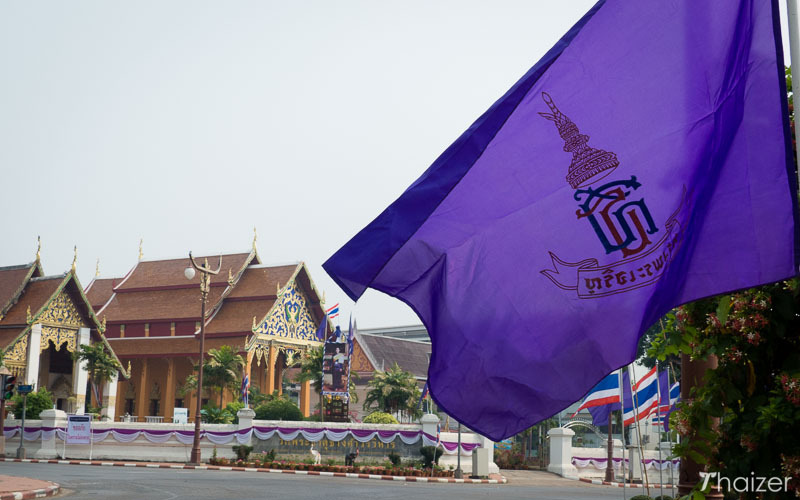 Streets across Thailand still were draped in purple flags bearing her royal signature, a sort of lingering reverie of her day. In Hua Hin, home of the royal residence, the princess’ purple flags could be seen hung next to yellow and blue flags, those belonging to the king and queen, respectively. But there was something amiss. The flag of the Crown Prince was not to be seen, and, indeed, rarely is. In a country where people cannot speak directly about the monarchy, instead, they communicate their support through symbols — the colors of Thai politics. No, you can’t say anything about that. But, in some countries, they don’t need to.